Adrian M. Ionescu is a Full Professor at the Ecole Polytechnique Fédérale de Lausanne (EPFL), Switzerland. He received the B.S./M.S. and Ph.D. degrees from the Polytechnic Institute of Bucharest, Romania and the National Polytechnic Institute of Grenoble, France, in 1989 and 1997, respectively. He held staff and/or visiting positions at LETI-Commissariat à l’Énergie Atomique, Grenoble, CNRS, Grenoble, and Stanford University, Stanford, CA, in 1998 and 1999. He was a visiting professor at the Tokyo Institute of Technology, Japan in 2012. He is the founder and director of the Nanoelectronic Devices Laboratory (Nanolab) of EPFL. The research of Nanolab focused on various research topics in the field of beyond CMOS and More-Than Moore devices and technologies. 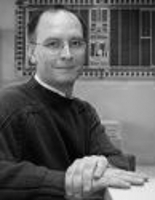 His group activities are centered on silicon micro/nano-electronics with special emphasis on the technology, design and modeling of new low power device concepts; steep slope transistors (tunnel FETs and ferroelectric FETs with negative capacitance), MEMS and NEMS devices with main emphasis on low power resonator concepts (vibrating body transistors), new materials (carbon nanotubes and graphene) to achieve novel analog and radio frequency functions and low power sensing (FinFET and stacked SiNW biosensors, CNT gas sensor arrays. Prof. Ionescu has published more than 300 articles in international journals and conference proceedings. He is cited on the Essential Science Indicators of Web of Science in the top world wide 5’000 Engineering leading scientists, with contributed hot papers. He is the recipient of the 2013 IBM Faculty Award and of the André Blondel Medal 2009 for contributions to the progress in engineering sciences in the domain of electronics as cited by Society of Electrical and Electronics Engineering (SEE, Paris), France. He and his PhD students won many Best Paper Awards at international conferences. He served on the International Electron Devices Meeting and ESSDERC/ESSCIRC technical committees and he was the Technical Program Committee Chair/Co-Chair of the European Solid-State Device Research Conference in 2006 and 2013. He is a member of the Scientific Committee of the Cluster for Application and Technology Research in Europe on Nanoelectronics (CATRENE) and the academic representative of Switzerland to the European Nanoelectronics Initiative Advisory Council (ENIAC). He is an elected Member of International Planning Working Group for Nanoelectronics from 2007 and he is the European Chair of the Emerging Research Devices of ITRS from 2010. Prof. Ionescu has been the initiator and coordinator of FET Flagship Guardian Angels for a Smarter Life, an advanced research program that was selected by the European Commission among the top four leading candidates. The Guardian Angels Consortium included 66 partners from top ranked European universities, large research institutes and leading industries. The course will give on overview of the main nanotechnologies and emerging nanomaterials and their applications regarding their impact on security and privacy aspects of data processing, storage and communication for the future society and Internet-of-Things applications. This course is designed for people with a large range of backgrounds including practicing scientists, engineers, economists but also political deciders. It provides them with basic knowledge about the potential and strategic role of nanotechnology in the future society. A scientific background would be a plus but not a ‘must’ prerequisite for understanding the majority of the concepts and discussions.